This ecological system is very similar to both the Western Great Plains Open Freshwater Depression Wetland and the Western Great Plains Closed Depression Wetland found in wetland complexes in the central and northeastern portion of Montana. However, this system differs due to increased soil salinity, which causes these systems to become brackish. This high salinity is attributed to high evaporation and the accumulation of minerals dissolved in the water. Wetlands in this system are discharge wetlands, where water high in dissolved salts has moved from the regional groundwater system into the depression. Hydroperiods vary depending on precipitation and snowmelt, the primary source of water. Water is prevented from percolating out of the depression due to impermeable dense clay, and salt encrustations can occur on the surface with drying. Species that typify this system are salt-tolerant and halophytic graminoids such as alkali bulrush (Schoenoplectus maritimus), common three square (Schoenoplectus pungens), inland saltgrass (Distichlis spicata), Nuttall’s alkali grass (Puccinellia nuttalliana), foxtail barley (Hordeum jubatum), red swampfire (Salicornia rubra) and freshwater cordgrass (Spartina pectinata), and shrubs such as black greasewood (Sarcobatus vermiculatus). During exceptionally wet years, an increase in precipitation can dilute the salt concentration in the soils in some cases, allowing for less salt-tolerant species to occur. The distribution of this system extends into central Montana, where it occurs in the matrix of the Northwestern Great Plains Mixed Grass Prairie. However, these depressions are most concentrated to the north of the HiLine and Route 2, from the Blackfeet Reservation to the North Dakota Border. Individual occurrences can also be found across the Northwest Glaciated Plains north of the Missouri River. This system can occur throughout the western Great Plains but is more prevalent in the south-central portions of the division. Its distribution extends into central Montana where it occurs in the matrix of the Northwestern Great Plains Mixed Grass Prairie. 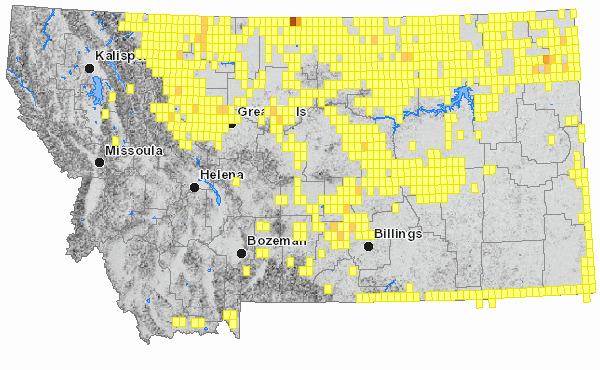 These saline depressions are most concentrated to the north of the HiLine and Route 2, from the Blackfeet Reservation to the North Dakota Border. Individual depressions can also be found across the Northwestern Glaciated Plains north of the Missouri River. Approximately 464 square kilometers are classified as Great Plains Saline Depression Wetland in the 2017 Montana Land Cover layers. Grid on map is based on USGS 7.5 minute quadrangle map boundaries. This system is distinguished from the freshwater depression systems by brackish water caused by strongly saline and alkaline soils. This high salinity is attributed to excessive evaporation and the accumulation of minerals dissolved in groundwater discharge. Water is prevented from percolating out of the depression due to an impermeable dense clay soil. Salt encrustations can occur on the surface due to slow water movement (Hansen et al, 1995). On the Blackfeet Indian reservation, water samples collected from saline depressions had conductivity values that ranged from 1,550-40,000 uhmos/cm (Lesica and Shelley, 1988). Vegetation within this system is highly influenced by soil salinity and soil moisture. Salt-tolerant and halophytic species that typify this system include alkali bulrush (Schoenoplectus maritimus), common three square (Schoenoplectus pungens), inland saltgrass (Distichlis spicata), Nuttall’s alkali grass (Puccinellia nuttalliana), foxtail barley (Hordeum jubatum), red swampfire (Salicornia rubra) and freshwater cordgrass (Spartina pectinata), and shrubs such as black greasewood (Sarcobatus vermiculatus). Other species include western wheatgrass (Pascopyrum smithii) and foxtail barley (Hordeum jubatum). Plant zonation related to soil salinity is often apparent in these systems. with distinct rings occurring around the fringe of the depression. In deeper, more depressed halophytic habitats, red swampfire or prairie cordgrass will dominate with Nuttall’s alkali grass found directly upslope, followed by inland saltgrass. Shrubs such as greasewood and winterfat (Krascheninnikovia lanata) are common around the outer margins of this system. Pursh seepweed (Suaeda calceoliformis), annual goosefoot (Chenopodium species) and seaside arrowgrass (Triglochin maritima) are common forbs. In northeastern Montana, the alkali bulrush association occurs as an emergent band around open water or as zonal vegetation around other plant associations. Water tables are often high, often remaining above the soil surface at least through late summer. Soils are poorly drained, alkaline Entisols. Alkali bulrush forms dense, monotypic stands with up to 91% cover. In some areas along the wetland edge, very minor amounts of common spikerush (Eleocharis palustris) may be present. Alkali bulrush can survive periods of total inundation up to 1 meter (3.3 feet) deep, as well as drought periods where the water table remains less than 1 meter below the soil surface. It is a vigorously rhizomatous species that colonizes and spreads when the water table is within 10 centimeters (4 inches) of the surface. Cover of alkali bulrush may be replaced by red swampfire and other associated species during drought years. Red swampfire occurs in the drawdown zone that is flooded during the early part of the growing season but where the water table drops below soil surface by late spring or early summer. Soils in this zone usually have silty-clay to clay texture, and the soil surface is covered with salt crusts. Principle salts are sulfates and chlorides of sodium and magnesium. It is one of a very few species that can persist in these hyper-saline conditions when the water table drops below the soil surface (Dodd and Coupland,1966). These systems developed under Northern Great Plains climatic conditions that include natural influence of periodic flooding events and occasional fire. Climate has an important effect on saline areas because precipitation and snowmelt transport salts to the depressions and can dilute the soil solution while temperature and wind influence the rate of evapotranspiration. Increased precipitation and/or runoff can dilute the salt concentration and allow for less salt-tolerant species to occur while increased evapotranspiration increases soil salinity leading to a more brackish habitat type. Changes will occur in the plant communities due to climatic conditions and/or management activities. In saline depression wetland systems where water has been drained or altered, the original hydrology of the system must be restored. If hydrology is restored, re-growth and re-colonization from dormant rhizomatous root systems of common emergent species can occur during periods of flooding. Cattle grazing should be deferred or controlled to allow regrowth, recolonization and resprouting from existing root systems. Annuals such as red swampfire and annual goosefoots require periods of inundation and drawdown to initiate germination and to complete their life cycles at the end of the growing season. Dodd, J. D., and R. T. Coupland. 1966. Vegetation of saline areas in Saskatchewan. Ecology 47(6):958-968. Lesica, P. 1989. The vegetation and flora of glaciated prairie potholes on the Blackfeet Indian Reservation, Montana. Unpublished report to Big Sky Field Office, The Nature Conservancy, Helena, MT, 26 pp.